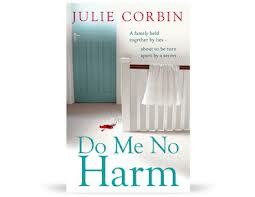 Do Me No Harm is the first book I have read by Julie Corbin so I wasn't sure what to expect. A FAMILY HELD TOGETHER BY LIES BUT ABOUT TO BE TORN APART BY A DEVASTATING SECRET . . . When her teenage son Robbie's drink is spiked, Olivia Somers is devastated. She has spent her adult life trying to protect people and keep them safe - not only as a mother, but also in her chosen profession as a doctor. So she tries to put it down to a horrible accident, in spite of the evidence suggesting malicious intent, and simply hopes no-one tries to endanger those she loves again. But someone from the past is after revenge. Someone closer to her family than she could possibly realise. Someone who will stop at nothing until they get the vengeance they crave. And, as she and her family come under increasing threat, the oath that Olivia took when she first became a doctor - to do no harm to others - will be tested to its very limits. I sat and devoured this book in one sitting it was so thrilling and gripping that it just didn't feel safe to put down! Each of the characters had a great depth to them which is great considering the amount of characters that were involved in this storyline. Olivia is a great character in this book she brought all kinds of emotions from vulnerability to tough and focused woman when trying to discover the truth and we see the lengths she would go to to protect her children and I genuinely felt for Olivia when we found out the secret she was hiding from her past. I don’t often read mystery/thrillers as I find with so many twists and turns, I often lost track with what’s going on and who are on the good side and who are on the bad side but with this book it wasn't the case, there were twists and turns but everything flowed smoothly so you don’t lose track and it becomes quite clear who is on the dark side! Some parts were a little predictable but there was such a big storyline that it really didn't affect the likeability of this book. I loved the romance that is slowly blossoming under the dark storyline it helps to lighten this tense read. A compelling and gripping read that needs to come with muscle relaxants!